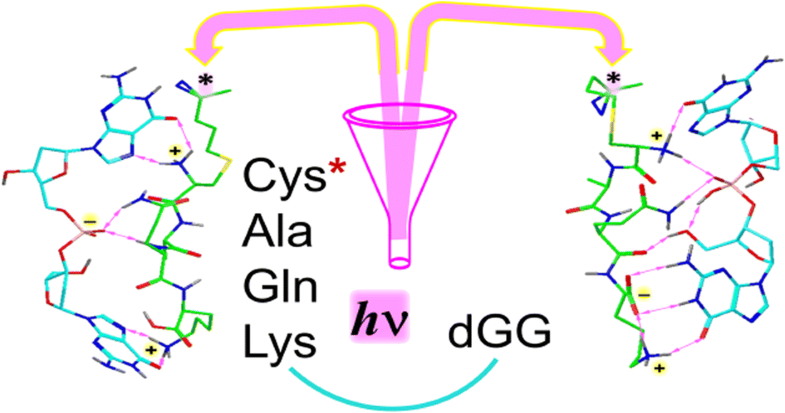 Non-covalent complexes of DNA dinucleotides dAA, dAT, dGG, dGC, and dCG with diazirine-tagged Cys-Ala-Gln-Lys peptides were generated as singly charged ions in the gas phase. Laser photodissociation at 355 nm of the diazirine ring in the gas-phase complexes created carbene intermediates that underwent covalent cross-linking to the dinucleotides. The dinucleotides differed in the cross-linking yields, ranging from 27 to 36% for dAA and dAT up to 90–98% for dGG, dGC, and dCG. 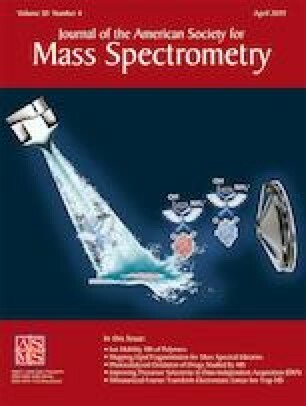 Collision-induced dissociation tandem mass spectrometry (CID-MS3) of the cross-linked conjugates revealed that fragmentation occurred chiefly in the dinucleotide moieties, resulting in a loss of a nucleobase and backbone cleavages. The CID-MS3 spectra further revealed that cross-links were primarily formed in the 3′-nucleotides for the dAT, dGC, and dCG combinations. Gas-phase and solution structures of dGG complexes with S-tagged CAQK were investigated by Born-Oppenheimer molecular dynamics (BOMD) and density functional theory calculations. The low free-energy complexes had zwitterionic structures in which the peptide was protonated at the N-terminus and in the Lys residue whereas the carboxyl or dGG phosphate were deprotonated, corresponding to the respective (Cys+, Lys+, COO−)+ and (Cys+, Lys+, phosphate−)+ protomeric types. Both types preferred structures in which the peptide N-terminal cysteine carrying the S-photo-tag was aligned with the 3′-guanine moiety. BOMD trajectories at 310 K were analyzed for close contacts of the incipient peptide carbene with the positions in dGG that pointed to frequent contacts with the N-1, NH2, and N-7 atoms of 3′-guanine, in agreement with the cross-linking results. Carbene insertion to the guanine N-1-H and NH2 bonds was calculated by density functional and Møller-Plesset perturbational theory to be 350–380 kJ mol−1 exothermic. Based on calculations, we proposed a mechanism for the carbene reaction with guanine starting with an exothermic attack at N-7 to form a dipolar intermediate that can close an aziridine ring in another exothermic reaction, forming a stable covalent cross link. The online version of this article ( https://doi.org/10.1007/s13361-019-02189-4) contains supplementary material, which is available to authorized users. This research has received funding from the National Science Foundation Division of Chemistry (Grants CHE-1661815 and CHE-1624430). F.T. thanks the Klaus and Mary Ann Saegebarth Endowment for support. Y. L. thanks Dr. Emilie Viglino for generous help with peptide synthesis.